Engineering innovation: it’s a simple idea, but its execution is anything but. Realized in the perpetual pursuit of industry-leading quality—and augmented by the certainty that everything we do can always be improved—at Daimler Trucks North America, this dedication to engineering innovation is embedded into our DNA. It’s what drives us to impact the economy and the world. If you keep an eye out for new trucks—anywhere on the highways of North America—you’re bound to have noticed the sharp, distinctive lines of the new Cascadia, launched by Freightliner in 2017, but there’s a lot more to this truck than a killer chassis design. 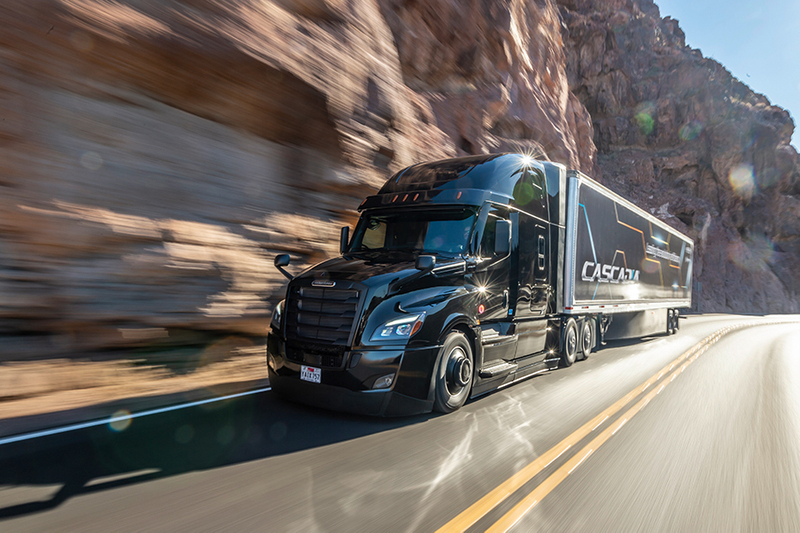 It’s packed to the gills with engineering innovation—the hallmark of Daimler Trucks North America—and loaded with cutting-edge breakthroughs in safety, fuel efficiency and connectivity. Today, we’re thrilled to announce a series of model-year 2020 enhancements to the new Cascadia, making it even safer, more efficient and better connected. Some of these innovations have never been seen in a class-8, on-highway truck, and others are more subtle, but together their impact is palpable. As vice president of sales for Freightliner, my job revolves around commercial trucks – all day, every day – as it has for years. Most of the time, as you might expect, it’s an office job. However, I recently had a great opportunity to put myself into the shoes of a long-haul truck driver. Over four days and three nights in a truck, I gained valuable, on-the-road insights that I never could’ve experienced in any office, and I made a new friend along the way. At Daimler Trucks North America (DTNA), we’ve been immersed in innovation since our founding, when Gottlieb Daimler invented the commercial truck. Striving to achieve and perpetually maintain an innovative mindset is something that impacts our every move, but we’re not simply chasing means to ends. Even our finite goals are built on a determined strategy to continually set innovative industry benchmarks, and we think perpetual innovation demands unique approaches to problem-solving and collaboration. One of many ways we’re thinking outside the box is through our collaborative partnership with Portland State University (PSU). This month marked the 10th anniversary of North America Fuel Systems Remanufacturing, a joint venture between Demand Detroit Remanufacturing and @boschusa. This partnership has produced over one million high-quality remanufactured fuel parts for the aftermarket industry.